1. CEN02 type has a timer, which controls the operation and interval time. The electronic box has operation, abnormal, feeding and interval indicators. 2. It has a float switch that can detect the oil volume. It will have abnormal signal automatically when the oil level is lower than the standard. 4. Please don’t press the force feed-oil ( Fbutton) more than three minutes in order to avoid overloading. When the temperature reaches 100℃, the sensor will be on to stop the motor continue running about 5 minutes. 6. Its function is similar to CEN01 type. The difference is CEN01 type is without timer (also could be controlled by Programmable Logic Controller) and CEN02 type is controlled by a timer. 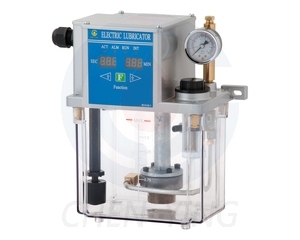 CEN03 and CEN04 types are pressure-relief type electric lubricators.